Sparta was one of the most powerful city-states in Ancient Greece. It is famous for its powerful army as well as its battles with the city-state of Athens during the Peloponnesian War. Sparta was located in a valley on the banks of the Eurotas River in the south-eastern portion of Greece. The lands it controlled were called Laconia and Messenia. Unlike their counterparts in the city of Athens, the Spartans didn't study philosophy, art, or theatre, they studied war. The Spartans were widely considered to have the strongest army and the best soldiers of any city-state in Ancient Greece. All Spartan men trained to become warriors from the day they were born. The Spartan Army fought in a Phalanx formation. They would line up side by side and several men deep. Then they would lock their shields together and advance on the enemy stabbing them with their spears. The Spartans spent their lives drilling and practicing their formations and it showed in battle. They rarely broke formation and could defeat much larger armies. 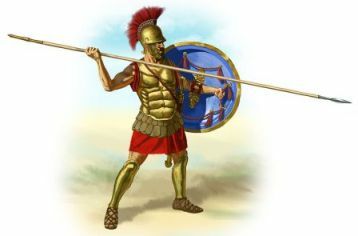 The basic equipment used by the Spartans included their shield (called an aspis), a spear (called a dory), and a short sword (called a xiphos). They also wore a crimson tunic so their bloody wounds wouldn't show. The most important piece of equipment to a Spartan was their shield. The biggest disgrace a soldier could suffer was to lose his shield in battle. Spartan society was divided into specific social classes. Spartan - At the top of Spartan society was the Spartan citizen. There were relatively few Spartan citizens. Spartan citizens were those people who could trace their ancestry to the original people who formed the city of Sparta. There were a few exceptions where adopted sons who performed well in battle could be given citizenship. Perioikoi - The perioikoi were free people who lived in Spartan lands, but were not Spartan citizens. They could travel to other cities, could own land, and were allowed to trade. Many of the perioikoi were Laconians who were defeated by the Spartans. Helot - The helots were the largest portion of the population. They were basically slaves or serfs to the Spartans. They farmed their own land, but had to give half of their crops to the Spartans as payment. Helots were beaten once a year and were forced to wear clothing made from animal skins. Helots caught trying to escape were generally killed. What was it like to grow up as a boy in Sparta? Spartan boys were trained to be soldiers from their youth. They were raised by their mothers until the age of seven and then they would enter a military school called the Agoge. At the Agoge the boys were trained how to fight, but also learned how to read and write. The Agoge was a tough school. The boys lived in barracks and were often beaten to make them tough. They were given little to eat in order to get used to what life would be like when they went to war. The boys were encouraged to fight one another. When the boys turned 20 they entered into the Spartan army. What was it like to grow up as a girl in Sparta? Spartan girls also went to school at the age of seven. Their school wasn't as tough as the boys, but they did train in athletics and exercise. It was important that the women stay fit so they would have strong sons who could fight for Sparta. The women of Sparta had more freedom and education than most Greek city-states at the time. Girls usually were married at the age of 18. The city of Sparta rose to power around 650 BC. From 492 BC to 449 BC, the Spartans led the Greek city-states in a war against the Persians. It was during the Persian Wars that the Spartans fought the famous battle of Thermopylae where 300 Spartans held off hundreds of thousands of Persians allowing the Greek army to escape. After the Persian Wars, Sparta went to war against Athens in the Peloponnesian War. The two city-states fought from 431 BC to 404 BC with Sparta eventually triumphing over Athens. Sparta began to decline in the coming years and lost the Battle of Leuctra to Thebes in 371 BC. However, it remained an independent city-state until Greece was conquered by the Roman Empire in 146 BC. Boys were encouraged to steal food. If they were caught, they were punished, not for stealing, but for getting caught. Spartan men were required to stay fit and ready to fight until the age of 60. The term "spartan" is often used to describe something simple or without comfort. The Spartans considered themselves to be direct descendents of the Greek hero Hercules. Sparta was ruled by two kings who had equal power. There was also a council of five men called the ephors who watched over the kings. Laws were made by a council of 30 elders which included the two kings.